Over two weekends in March, 2009, 15 bands got two hours each to lay down one track live off the floor. These songs would then go on to be part of one of the best local compilations of all time, Ottawa Gaga Volume 1. Going Gaga Records was a local record label founded by Ian Manhire (White Wires, Sedatives, and Voicemail) and Ottawa Gaga Weekend was a three-day gathering of mostly local, and some out-of-town, rock, garage and punk bands in Ottawa for an unforgettable few days. 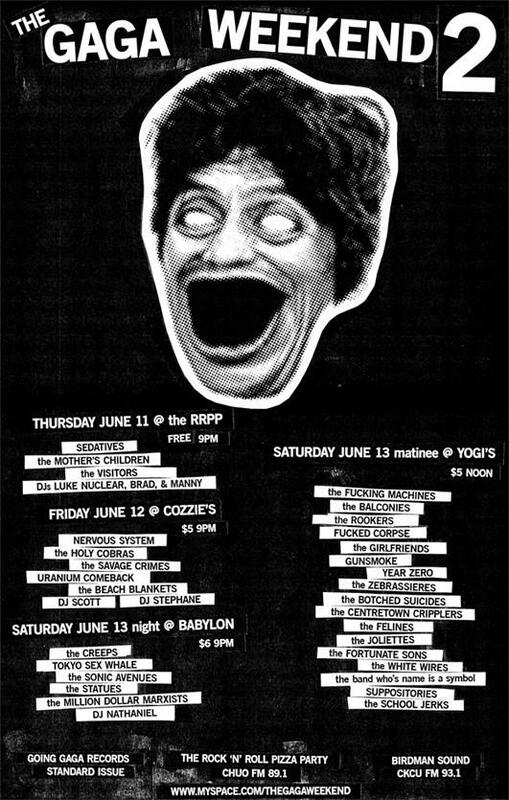 This event, which dates back to 2008, was the precursor to what I call Ottawa’s punk and garage Christmas in June, more commonly known as Ottawa Explosion. Poster for Ottawa Gaga Weekend in from 2009. Cool to note that Yogi’s is the original recording studio/venue by now owner of House of Targ, Yogi Granger. Of the 15 bands to lay down tracks for the Gaga compilation, only three remain active (The Creeps, The White Wires and Mother’s Children). That isn’t to many of the people who locked themselves away during a frosty weekend in the capital aren’t still major players in the Ottawa music scene. Earlier this year the compilation, Ottawa Gaga Volume 1, was finally put online for our listening pleasure…and oh have we listened. This compilation is a blast from the past to anyone who went to shows at the time. This is the era of the Rock n’ Roll Pizza Party and when garage rock was king in Ottawa. I have so many fond memories of many of these bands, and the Million Dollar Marxists will always be one that holds a special place in my heart. We interviewed Jordy Bell, member of The Creeps and Crusades, who helped put the weekends together and mixed the compilation. What was Ottawa like in 2009? 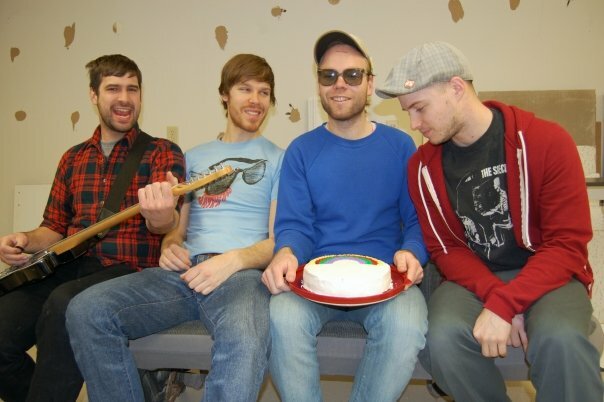 The Ottawa scene in 2009 was going through a pretty explosive period. It was around this time that Emmanuel Sayer, Luke Martin, and Brad McQuoat were running the Rock N’ Roll Pizza Party night, a weekly night that was hosted at various venues around town (the Bytown Tavern was its longest running spot, which is now a Comedy Club on Elgin St.). The night usually featured a few local bands and a touring band, so it brought a lot of different musicians and people into the same room. This subsequently led to the formation of quite a few bands, and even more new friendships. Who came up with this great idea? It was definitely Ian Manhire who conceived the idea, and was responsible for curating the compilation. Ian was already active in the Ottawa scene, putting out records on the now defunct Going Gaga Records. The idea was to record a small snapshot of some of the bands in the scene, at the time. It was probably a discussion at a Rock n’ Roll Pizza Party that led myself (Jordy), and Ian Showalter (Suppositories, Dagger Eyes, and current House of Targ sound engineer) to volunteer our time and skills to record it. We decided to not go the traditional compilation route, and thought it would be fun to try and record all of the bands ourselves in a couple of weekends. It sounded like a daunting task, but each band was scheduled in a 2 hour time slot, and we tracked each band one by one. Where was the recording done? The recording was all done at the old Capital Rehearsal space, run by Luke Martin. The old location was at 240 Bank St (Luke has since moved the business to the City Centre building), and was in the basement of a government building. He set aside one of his jam rooms for us, and we had our little ‘control room’, located in the lobby outside of that room. Who was the team that took on this task? Ian Showalter and myself were responsible for the entire recording and mixing portion of the record. Ian handled all the on-site engineering, running the recording software, and I was responsible for getting the bands set up in the room, and making sure mics stayed in place in between takes. I handled the mixing portion of the record, with Ian Manhire, and Ian Showalter sitting in on the mixes. Mixing was completed at my current workplace, Atomic Audio, located in the west end of Ottawa. Once the mixes were complete, they were sent to Bova Sound, a family run studio in the city, for mastering. Can you shine a little light on the set up? The idea was to record the compilation with all the same gear. There was two reasons for this. First, we wanted the record to have a cohesive feel to it, often compilations are pretty jarring with a wide range of recording sources. The second reason was just for simplicity. Trying to record that many bands, on all different gear would have taken much longer. So, we settled on using one drum kit, with each drummer bringing in their ‘breakables’ (industry speak for the kick pedal, cymbals, and snare drum). I believe the bass amp we used was a Fender Musicmaster Bass Amp, and the guitar amps were Marshall heads and cabs for the most part. A few people brought in their own heads, or small solid state amplifiers as well. Using all the same gear actually simplified the mixing process as well, as in most cases I was able to apply the same kinds of processing (EQ’s, compression, etc) on each track, then just make minor adjustments to the individual performances of each band. Can you share any stories about those two weekends, some memorable moments or silly little anecdotes? It was just a lot of fun, and incredibly busy. Once we got everything set up, it was just a case of getting each band through their recording session. There was still a lot of time to hang out, and generally even once a band finished recording their song, they’d stick around and hang out, and have a beer. One story that sticks out in my own mind, was the recording of the Beach Blankets song “Greatest Hit.” The Beach Blankets had a short and raucous existence in town. In that song you can hear the sounds of bottle clinks, claps, and general chaos. This was because after they were done recording the music and lead vocals for the song, they had between 20 and 30 of their friends fill the room and recorded a take of everyone partying and making noise. Ian decided it would open the record, and I think it perfectly sets the tone for the rest of the record. What band from the Ottawa Gaga would you like to see get back together? If I had to choose just one from that list that I’d like to see get back together, it would be Sedatives. I say this knowing that, in very recent days, the Sedatives have actually started to get back into the rehearsal room. 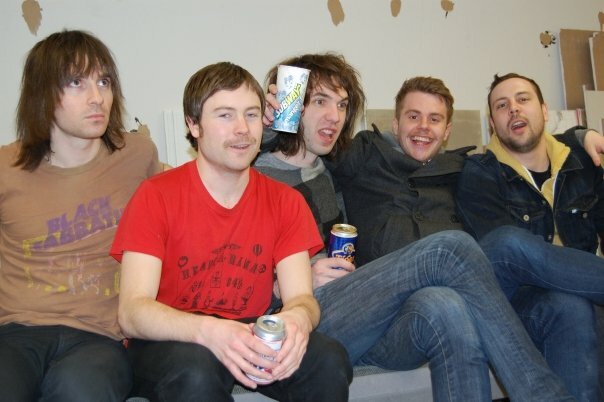 I came to know the members of the band (Emmanuel Sayer, Dave Williams, Ian Manhire, and Steve Adamyk) from Rock and Roll Pizza Party first, and since those early days, they’ve become some of my closest friends (I currently play in Crusades with Dave and Emmanuel, and in Cheap Whine with Steve). I’m happy that they’ve decided to pick it back up, and am curious to see what comes of the reformation. What is your favourite song on the compilation? The Million Dollar Marxists song is my favourite. Listening back to it now, it makes me nostalgic about the early 2000’s in Ottawa. Before Rock and Roll Pizza Party, there was Bumper’s Pool Hall, which was located at 580 Bank St. (currently the home of the Works burger joint). This was my introduction to the punk scene in Ottawa. As someone who moved here in 1998, and formed a band (The Creeps) shortly after that, it was where I met a number of people in the scene (including Luke Martin of the Marxists, who was doing sound there at the time). When we recorded this compilation, the Marxists were essentially done, but Ian Manhire convinced them to record a song for the compilation. I’d be very interested in seeing what a compilation like this would look like today. 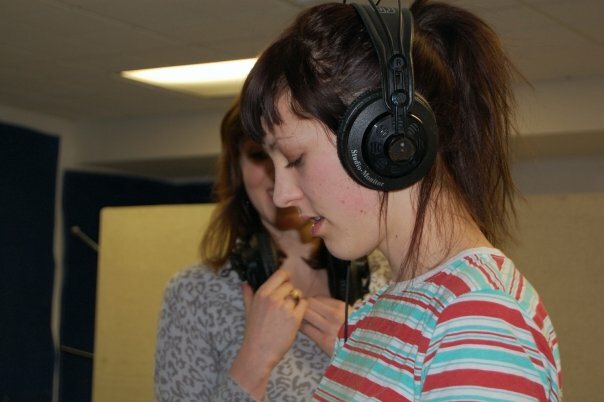 It’s been six years since we recorded ‘Ottawa Gaga’, and the city, and music scene has changed so much in that time. If anything, the scene continues to expand and thrive at an exponential rate. While many of the musicians on this compilation continue to make music, there is also a wave of younger musicians and bands that continue to innovate and push the boundaries of music in Ottawa.